Disclosure: I received a complimentary copy of this book from the publisher through BookLook Bloggers in exchange for an honest review. 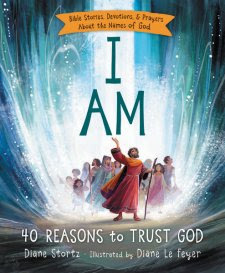 I AM: 40 Reasons to Trust God is children's book of Old and New Testament stories of the Bible. There are 40 stories with 40 different names of God, one for each story. It gives the name, meaning of the name, pronunciation, age appropriate Biblical story, devotion, prayer, scripture, and ways at the end of the chapter to have your child learn more. Each page is beautifully illustrated by: Diane Le Feyer, and it makes the stories and meanings just bounce off the page right into your child's heart and memory. This was a fascinating title to me, and something both my husband and I wanted to know more about. We are going through each of the chapters and names of God, once a week in our homeschool lessons with our sons. It has been wonderful to read this together as a family, and have each of us know more about God. I would highly recommend this book to add to a church or home library. The colorful images draw you into the book, and there is a new way to look at the classical Biblical stories we all know and love. It would be an amazing way to connect with your children or grandchildren, and have you all learn together. The possibilities of learning with this book are endless to having it be enjoyed as a bedtime story to incorporating into a Sunday School lesson. Thanks for stopping by to read my review. If you get a chance to read this book, I hope you enjoy it as much as my family and I are. I am always blessed by a study of the names of God! What a beautiful resource! Thanks for sharing. Kelley, This looks like an absolutely fantastic book! I am going to get one for sure! This seems like a wonderful book to read with children. A win/win as everyone will learn :) The illustrations look beautiful too! That's a really good book to have around the house (or school). A good influence to young minds as we see a lot of non-child friendly reads on the internet today. I love that this doesn't sound like your typical devotional for kids. The fact that they've focused on the names of God makes it stand out. Do you know what age group it's recommended for? From the sounds of it, it seems that even adults can benefit from this as well, don't you think? I have been looking for stories to do for VBS this year. I want to do lots of art work, but sometimes it is hard to find good Bible stories. I don't have time to write them either. This sounds like a perfect resource - to study and use. I can see choosing a scripture from each lesson to memorize and study. Thanks for review, I might add this to my son's Easter basket! This book looks AMAZING, and I want to go and buy it right now!!! Love having you as a part of Booknificent Thursday!